In our series on start-ups, we showcase a company, whose product has attracted Fortune 500 companies and venture capitalists (VCs) within a year of its launch. Unmetric, founded by Lakshmanan Narayan along with two of his classmates from IIT-Madras, Joseph Varghese and Kumar Krishnasami, helps corporates use social tools to understand their competitors' social media strategy. Besides winning some of the Fortune 500 companies as clients, this start-up has attracted an investment of $3 million. In fact, Lakshmanan Narayan's foray into entrepreneurship started way back in 1995, when he was a student of the Indian Institute of Management (IIM) Calcutta. Lakshmanan Narayan, CEO of the company talks about his journey as an entrepreneur that culminated in the highly successful Unmetric. 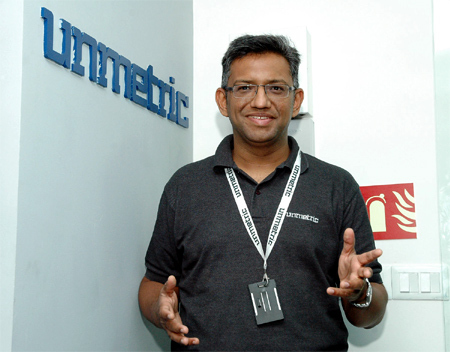 Image: Lakshmanan Narayan, CEO, Unmetric. When I was about to graduate from IIM-C in 1995, the regular norm was to take up a corporate job. But a few of us decided not to go for placement. We would start our own event marketing company. In fact, we had named it Ropetrick. We named it so, planning to do some magic in the events. We had shaped our company on the lines of Wizkraft of Mumbai. We thought event management is needed not only in Mumbai and Delhi but other places too, so we decided to concentrate on south India. The first business pitch we made was to ABCL which had just started then with an event marketing wing. We sent a proposal to ABCL expecting no reply. Those were the days of letters and not emails. Within two weeks, we were invited to meet them. The CEO liked our energy and enthusiasm and offered us jobs saying that we could develop the wing like our own start up. We fell for the offer and accepted it. We joined ABCL and Ropetrick died. I worked there for exactly 365 days because I found no excitement in working elsewhere and I got wind of what was happening to ABCL. Image: Lakshmanan Narayan with Kumar Krishnasami. While doing various events for ABCL, we found it difficult to get things like caps, vests, etc that were needed for various events. There are many who make these little, little crazy things and there are people who are in need of these amazing stuff. There was no internet to google and find them like it is today. We thought we could be the interface. We decided to make a full fledged directory in the form of a floppy with all the contacts. I started 'Idea Logic' and with Rs 40,000 and a computer gifted by my father. My first product was 'Finger Tips', the directory. I hired 2-3 college students to get information. Within a month, I understood it required a lot more time and human power. I miscalculated the whole thing. After 2-3 months, I closed it down. After Finger Tips, Idea Logic started marketing for liquor companies to the Hindi film industry. They threw a lot of parties and were in need of foreign brands. Those were the days when liquor could not be advertised. Along with Sunil Doshi, who had by then left ABCL, we launched a company Alliance Media and Entertainment that sold Hindi films to other countries. We sold films and took 15% commission. This we continued for two-and-a-half years and by 1998, I left the company to move from Mumbai with my wife and child. From 1998 to 2005, I bid goodbye to entrepreneurship and worked with Lintas in Dubai in the field of advertising. It was in 2005 that I met my old friend Sekhar Vembu, another IIT-ian who had an interesting idea about data backup and he urged me to come to Chennai. I co-founded Vembu Technologies with him, and I agreed to take care of the marketing part while Sekhar was in charge of the technology part. I enjoyed building the company and it was also my introduction to technology entrepreneurship. It was great to be a part of a start-up company after my days in the large companies. In 2010, media was becoming a major part of our lives. I had an idea about social media for small businesses. The trigger came while setting up the Facebook and Twitter accounts of Vembu Technologies. I left Vembu in 2010 but am still a director there, and started up my own company Eyes and Feet independently. I invested Rs 20 lakh and started the company with 3 peop#8804 the office was my bed room! Incidentally, my wife who was also from IIM-C left her corporate job and started her own start up. So, we had two start ups working from our home! Those were crazy days but it was fun. What we made was a web application which allows you to look at what your competitors are doing on social media. I chose US as the restaurant market we were going to target as it was and is the big social media market. If you take New York, there are 6000 restaurants active on Facebook. From my Vembu experience, I learnt that you can sit anywhere in the world and work. It is a new world. You can create start ups in India and use the companies to make revenues from elsewhere in the world. We sat at Palavakkam in Chennai and produced products for our market in Manhattan! There was an event called Seedcamp in Singapore that was to identify 30 hot start ups in the APEC region. We won an award and got coverage all over the world. In 2010 itself, we got 3,000 sign ups and investor interest as well. It was an interesting time and I wanted to make the company strong technologically. So, I convinced two of my best friends from IIT-Madras - Joseph Varghese and Kumar Krishnasami - to join as co-founders. We decided to call it Tech Origami Software Pvt Ltd mainly because nobody in Chennai will join a company that is named 'Eyes and Feet'! Sekar Vembu became an angel investor in the company. Another person also joined as an Angel investor. Kumar chose to work from Coimbatore and Joseph, from Chicago. We started off with the product Eyes and feet to target small restaurants. My visit to the US in January 2011 changed the direction. I went to the US to identify the potential partners for our product, 'Eyes and Feet'. I met some big guys like the American Express or Capital One Bank who could help me get in touch with 20,000 restaurants in one go. I also met a lot of restaurant owners. I found two things, restaurants are an incredibly difficult market to crack. But the interesting thing was, the big guys are trying to figure out what their competitors are doing on their social pages. I learnt that we had to target the big guys and not the small ones. I also learnt that we were focussing on the wrong market and that we could not sell a product like Eyes and Feet to these big guys. My co-founders also agreed that we had to have a similar product but more technologically advanced for the big ones. We thought we would focus on a new product and wind up 'Eyes and Feet'. We worked really hard to build a new product which would help corporates know what their competitors are doing on social media and analyse the data for them. Today, social media is extremely important for even the biggest brands. Though the awareness among companies on social media is more in the US, it is happening in India also as India too is a huge Facebook country. If you look at the Fortune 500 companies, they have a well staffed social media department. We launched the product Unmetric one year ago. We named it so as we are still trying to 'metric' something that is still unfathomable. Three of us put in a capital of around Rs 60 lakh – Rs 1 crore and named our new product company also Unmetric and launched it in August 2011. This is the advantage of starting a company when you are 40; you will have some savings. We had decided to target only the Fortune 500 companies in the US. We validated it by pitching it in India. We sold the product first to Citibank. Bharti Airtel and Make My Trip were our first customers. When we realised that we could get Fortune 500 companies of the world, we wanted to scale up fast so we spoke to the VCs. In November 2011, I presented our business plan in front of investors in Delhi at the Global Super Angels Forum in Delhi. Within 2 weeks, 5-6 VCs started talking to us. In December 2011, Nexus Venture Partners investors invested $3 million in our company. 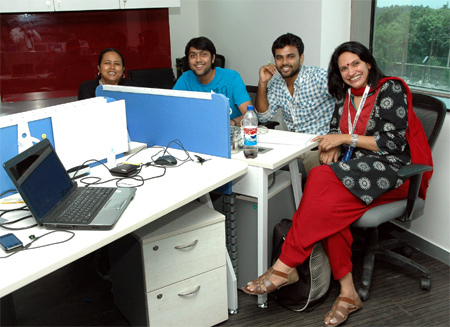 Today, we have 25 employees, 14 in Chennai, 8 in Coimbatore and 3 in the US. We have signed up JP Morgan, Zocalo, Subway Sandwich, etc for thousands of dollars. A lot more are in the pipeline, on the verge of signing. Totally, we have 10 clients now in the US and India. We are getting enquiries from the UK, Australia, Singapore and even from non-English speaking European countries. There are 1000 odd enquiries and more than 50 are from Fortune 500 companies. It is a year since we first launched the company, and it has been a roller coaster of a year. 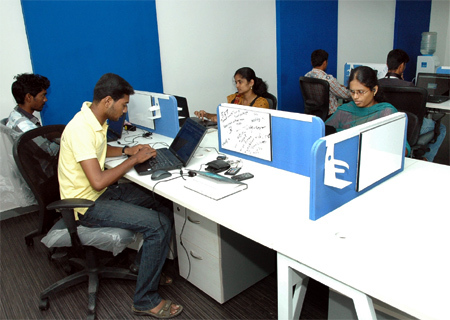 From our bed rooms, we have moved to new offices in Chennai, Coimbatore and the US. As a person who has been in the business for quite sometime, I would say having an idea is not enough; go behind it. This is the best time to be an entrepreneur in India. SUCCESS story: He started a software company at 18!